When I asked my wife just over 20 years ago which part of the Southwest we should buy a home in … not thinking of moving permanently, she unhesitatingly said, “Santa Fe, its an arts town!” Little did we know that our many visits here had only scratched the surface. There are roughly, 80,000 residents in the “City Different” and 150,000 in Santa Fe County. The town has four State owned museums and four private ones plus two kunsthalles presenting contemporary work. Many have heard about the galleries here but then there are also interesting art spaces worth seeing. The Ralph T. Coe Center for the Arts which I have written about qualifies as one. The other day we “discovered” another. Of course, we did not “discover” it as we had often heard of the Thoma Foundation. We knew it was contemporary art which we have mixed reactions to, so it was not at the top of our priority list. We recently decided we were finally going to go, a whole 7 minute drive from our home. It is in a small historic house on Delgado Street which has a number of galleries leading up to the famous Canyon Road, the art street of town. The Carl and Marilyn Thoma Art Foundation is active both in the couple’s home town of, Chicago and Santa Fe, where they also have a house. Carl is a venture capitalist and Marilyn started out at Quaker Oats becoming marketing manager and then moving on to do marketing for communications companies. They started the Foundation in 2014. 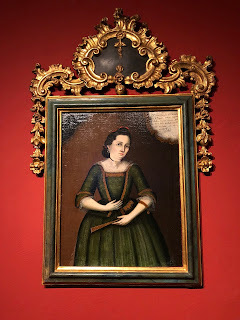 The Thoma’s main collections are in Chicago, but they keep their collection of Digital Art in Santa Fe and it gets rotated in their exhibition space here. When I heard digital art I wanted to run but visiting the Foundation I was quickly drawn in by some of the works. I will admit upfront that some of the pieces and their labels made me equally dizzy but then others pieces were intriguing, so much so that one might feel comfortable living with them long term. These are not action images by any means, but rather slow moving contemplative ones. Some concepts are explained in labels in art-speak, a language I never learned. A work in the first exhibition room reminds me of a traditional weaving. It is a cotton tapestry by Laura Splan (b. Memphis, 1973) woven on a computerized jacquard loom. It is called appropriately, “Squint” (2016). Of course, I interpreted it quite differently from the label which says in part, “The Squint tapestry is the result of the artist conducting a biometric reading of the electrical activity of the muscles surrounding her eyes (orbicularis Oculi) as she squinted….” This is just the easier part of the procedure to understand! I do see that if you understand science and have the right equipment you can do this, but it seems a long way from where I have always believed art comes from. Obviously, I have lots to learn! Some digital images turn out to be calming and quiet such as Daniel Canogar’s (Madrid, Spain 1964 - ) “Gust”. It is a digital sculpture with flexible LED lights, custom software and the internet. It uses real-time wind data in Santa Fe to generate a live, responsive light animation. The piece I most related to is by the well-known theater director and designer, Robert Wilson, (Waco, Texas, 1941 - ). To my astonishment and pleasure he picked a neo-classical theme. His model is Lady Gaga and his guide is the artist, Jean-Auguste-Dominque Ingres who painted the portrait of Madmoiselle Caroline Rivière in 1806 which hangs in the Musée du Louvre. Wilson’s portrait Lady Gaga: Mademoiselle Caroline Rivière”, 2013, is created in high-definition video on plasma monitor with music by Michael Galasso. It is extremely slow moving. Here is an image of Lady Gaga with eyes open and then a video where if you look carefully a bird flies across the sky. 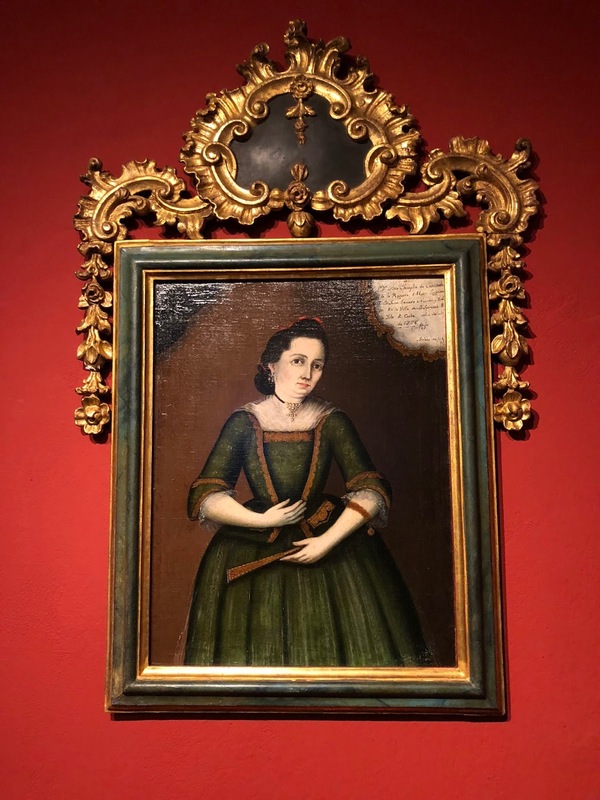 Wilson’s work is hung beside an 18th portrait of a woman by Andrés Solano (Carribean, active (1732-1789) from the Thoma’s Spanish Colonial collection. It makes a conscious and interesting and maybe, even shocking, juxtaposition. On the opposite wall an interactive video by Daniel Rozin (Jerusalem, 1961 - ) shows the two portraits and you, the viewers, who materialize and disappear while the portraits remain. It is called “Selfish Gene Mirror” (2015) it is done with custom software, webcam, computer and monitor. Quoting the label “In Selfish Gene Mirror, the artist’s customized “Darwinian Algorithm” creates a didital gene pool in which lines of approximately ten pixels behave like competing genes. Of the 10,000 or so pixel groupings, only half will survive this competition to replicate and blossom into the viewers image.” Mr. Rozin is stated to be working from a 1976 book “The Selfish Gene” by a philosopher, Richard Dawking, but we don’t have to know that to enjoy the piece. It often takes a while to accept a new form of art. We all like what we know and are used to, but when push comes, sometimes, to shove (by my wife or a friend) I may find that my prejudices are ill-founded and I actually enjoy it. Who knows, maybe I will return to the Thoma Foundation in order to understand what I saw better than on my first exposure.